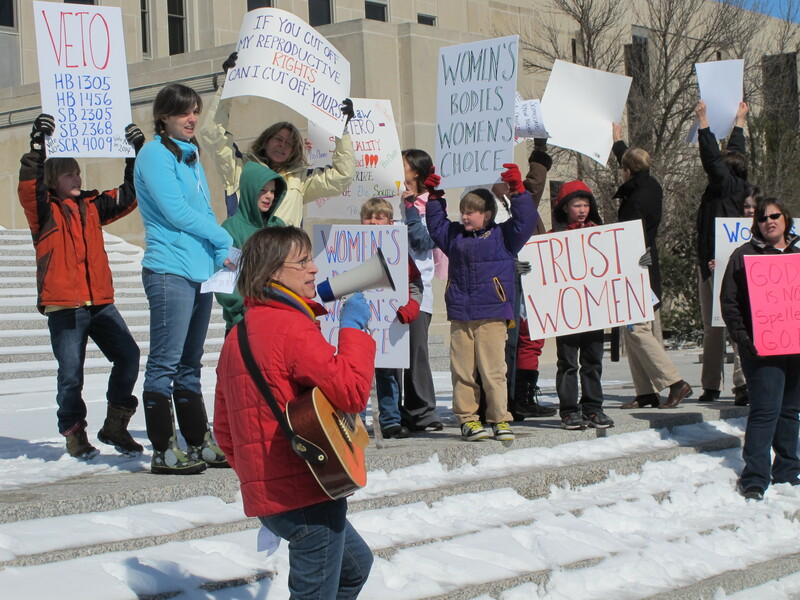 BISMARCK, N.D. More than 300 abortion-rights activists carried signs and chanted, "Veto! Veto! Veto!" in a demonstration Monday at the state Capitol protesting a package of measures that would give the state the toughest abortion restrictions in the nation. The newly formed Stand Up For Women North Dakota also planned rallies Monday in Fargo, Grand Forks and Minot, said Robin Nelson, one of the organizers of the demonstration. "The intent is to stop the attack on women's rights in our state," said Nelson, of Fargo. Russell and Jenn Landphere of Bismarck brought their two infant sons with them to the Capitol. "The priorities of this state are not in the right place," said Russell Landphere, who took a late lunch from his job as a civil engineer to attend the rally with his family. "We're here as a family supporting women's rights," Jenn Landphere said. "We feel it's a woman's choice or a family's choice -- not the government's choice." North Dakota lawmakers moved Friday to outlaw abortion in the state by passing a resolution defining life as starting at conception, essentially banning abortion in the state. The North Dakota House approved the bill 57-35 Friday, sending it to voters likely in November 2014. The Senate approved it last month. Representatives also endorsed two other anti-abortion bills Friday. One would ban abortions after 20 weeks of pregnancy based on the disputed premise that fetuses feel pain at that point. Lawmakers also passed another measure that requires a doctor who performs abortions to be a physician with hospital-admitting privileges. The Republican-controlled Legislature had already passed measures that would ban abortion as early as six weeks, or as soon as a fetal heartbeat is detected, and because of genetic defects such as Down syndrome. Together, those bills would give North Dakota the strictest abortion laws in the nation. The measure requiring doctors with hospital-admitting privileges to perform abortions, the genetic defects bill and the so-called fetal heartbeat measure were the first to reach Gov. Jack Dalrymple's desk Monday afternoon. The Republican, who hasn't yet indicated whether he supports the measures, has three legislative days to act on the bills. The proposed North Dakota legislation is aimed at shutting down the state's sole abortion clinic in Fargo and backers say it's a direct challenge to the U.S. Supreme Court's Roe v. Wade ruling that legalized abortion up until viability, which is usually at 22 to 24 weeks. The demonstration Monday took place both outside the Capitol and inside the building while the Legislature was holding floor sessions in both chambers. An increased number of North Dakota state troopers patrolled the Capitol during the rally. No incidents were reported. Dina Butcher, a private investigator from Bismarck, drew loud cheers after telling the crowd that the lawmakers should not be "legislating women's reproductive rights." The demonstrators could be heard by lawmakers who were meeting in their chambers down the hall. "I am a Republican who believes in the very conservative principle of less government intrusion in my life," she said. "Where are the real conservatives when you need them?"